Here two freely subdivisible parallel office wings are connected by a fully glazed open central zone. 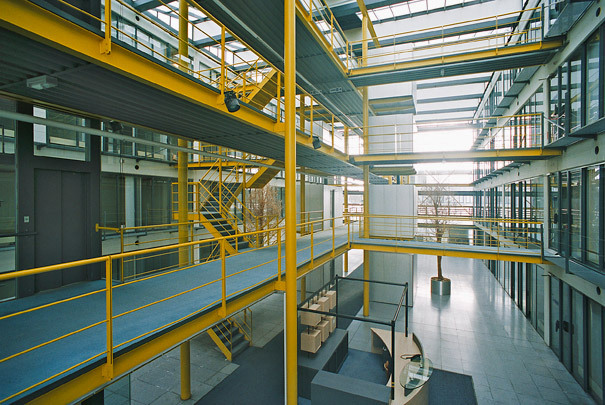 A gallery runs through the centre of this space on each level, off which are stairs, lifts, sanitary capsules and all service shafts issuing from the plant tower at the rear. With the office floors completely free of fixed elements, the internal subdivision of this building for subletting to companies in the computer industry can be easily modified by inserting detachable bridges between the gallery and the office wings.